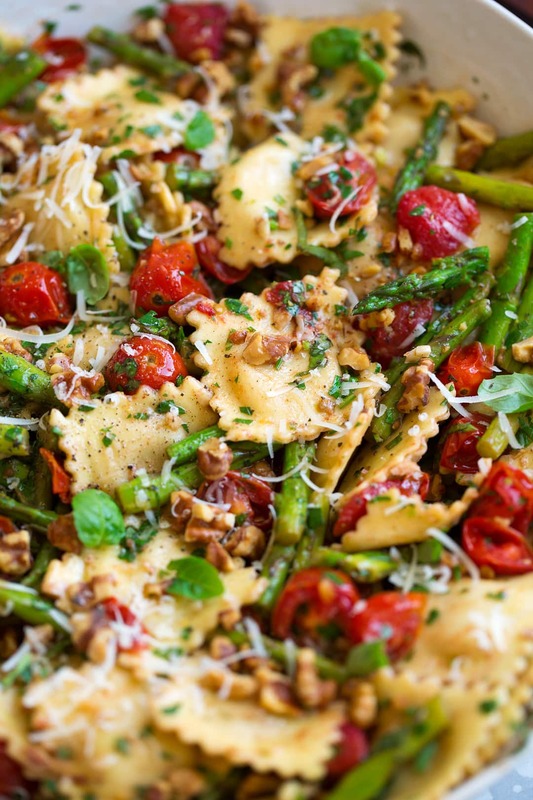 This Ravioli with Tomatoes Asparagus Garlic and Herbs uses a store-bought four cheese ravioli to save tons of time, it’s paired with lots of fresh veggies, then to make everything shine it’s coated with a buttery garlic herb sauce, balsamic vinegar and parmesan. 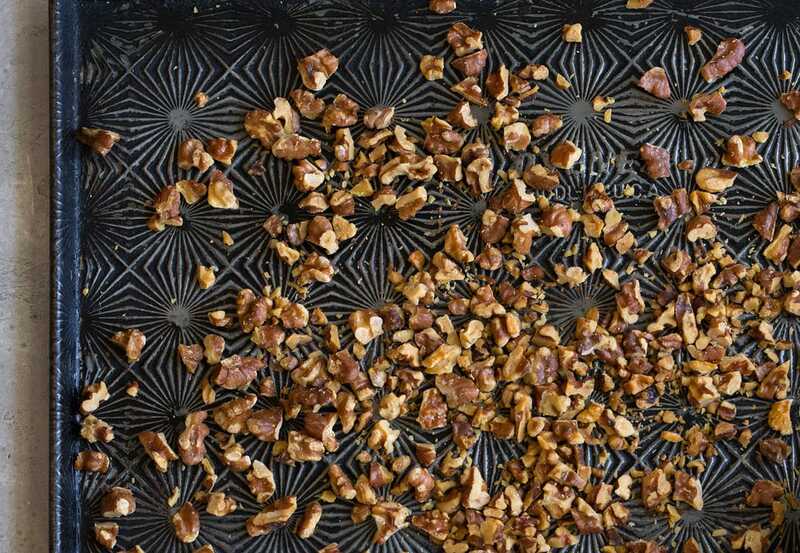 And did I mention you’ll love that crunch from the walnuts? Don’t skip them! Who doesn’t love a super easy, perfectly comforting and satisfying semi-homemade meal? Come Thursday and Friday I’m always looking for the quickest, simplest dinners. 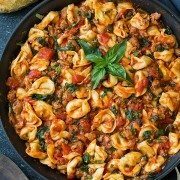 Something that will still be flavorful and my family will eat and enjoy, but I want something that doesn’t require a lot of effort on my part. Because life just happened through the week and now we’re tired and want to relax right? So here we have the perfect easy dinner (that is actually fitting for any night of the week). It’s so delicious and perfectly hearty. And who wouldn’t love it?? 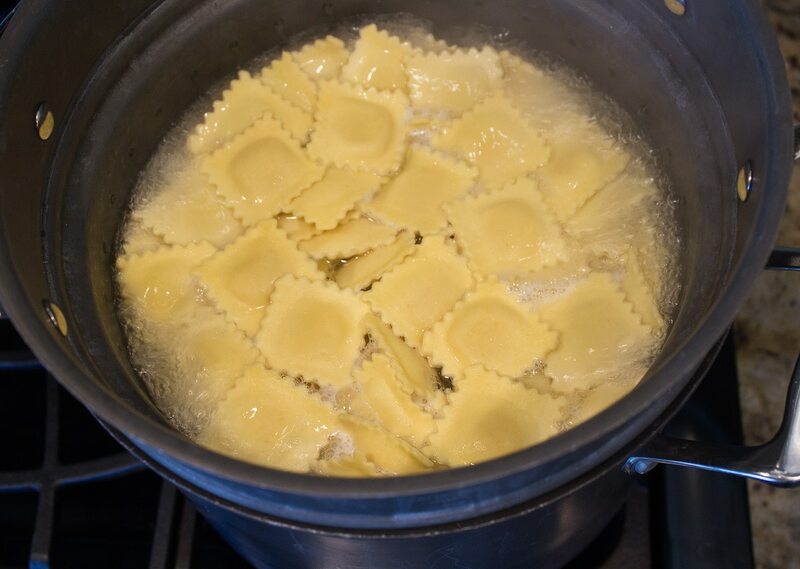 First you’ll boil the ravioli according to package instructions (usually about 7 minutes). While that’s cooking you’ll melt butter with olive oil in a large skillet. 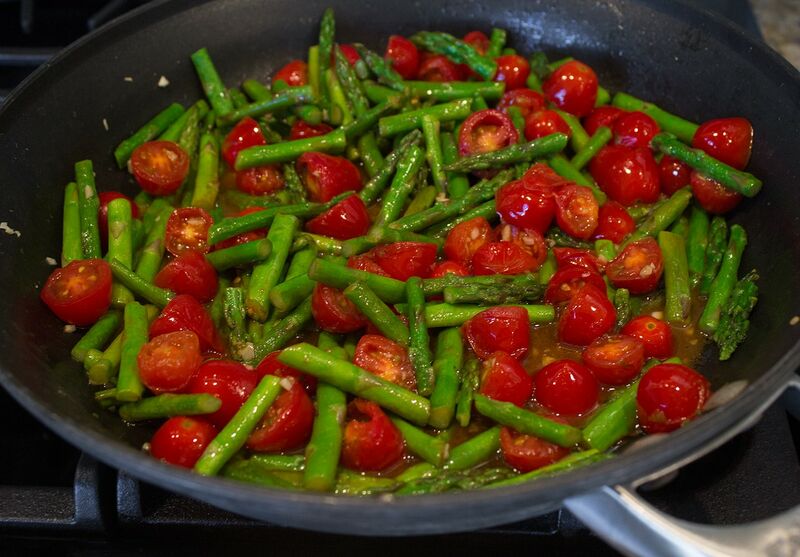 Then you’ll saute the asparagus until it’s tender and add tomatoes and garlic and saute to warm tomatoes through. Now you’ll pour in a splash of balsamic vinegar (hello flavor!). 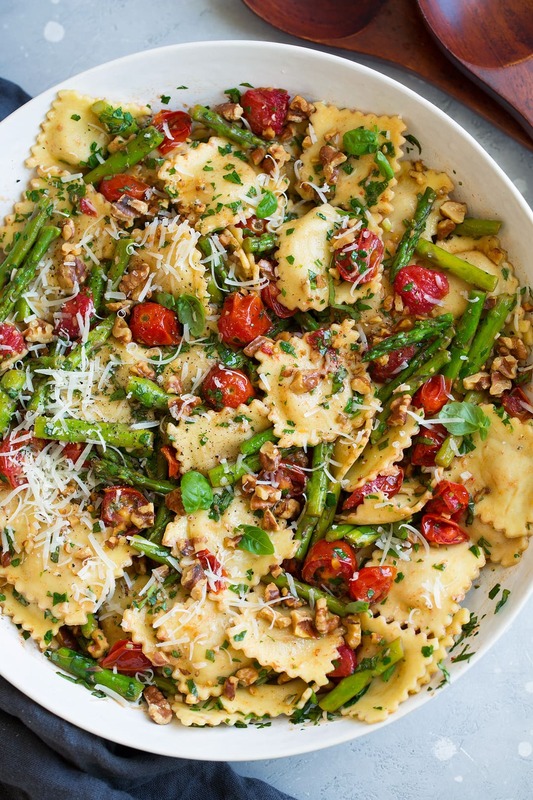 To finish it all off you’ll pour the cooked and drained ravioli in to a large bowl along with that asparagus mixture, the walnut, fresh herbs, and season with salt and pepper to taste and give it a good toss. And finally finish it off with a large handful of shredded parmesan. Because what’s a good pasta dish without parmesan? You might just think of the walnuts as an optional ingredient here but trust me you don’t want to leave them out! They just give a textural balance to the recipe. 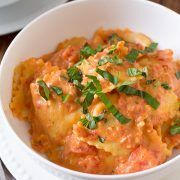 I used Fisher Walnuts for this ravioli recipe. 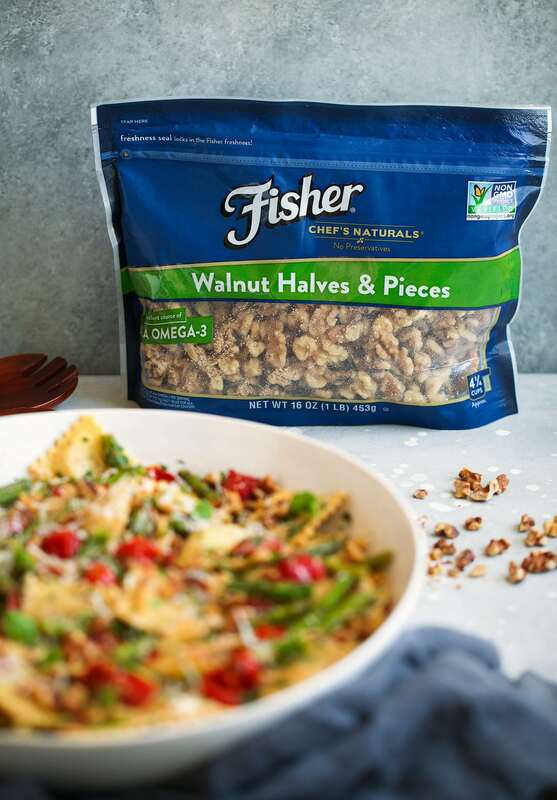 They are my go-to brand for walnuts and this is my third year in partnership with Fisher! 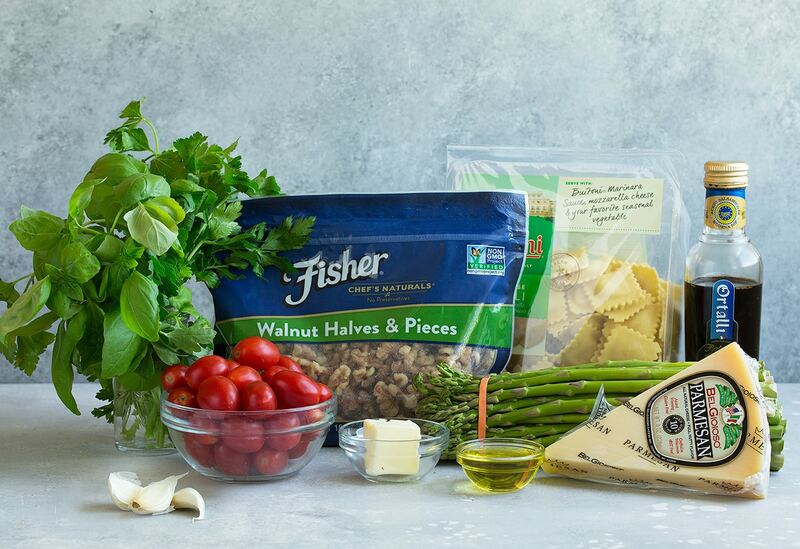 I choose to work with Fisher because I love the reliably delicious flavor of their products and I love that their nuts are preservative free and non-GMO project verified. I also love the convenient stand up resealable packaging that helps the nuts stay fresher longer. Visit www.FisherNuts.com for more recipe inspiration. And you can purchase Fisher Nuts on Amazon. 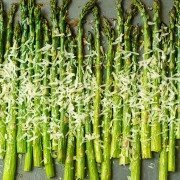 When asparagus isn’t in season you could also try this with green beans. Note that they will need longer to saute. If you don’t want to buy both kinds of herbs you can use all basil or all parsley. Love parmesan? Feel free to add the to your hearts content, and even try swapping the parm out with Romano. If you’ve got extra time swap those 3 cloves of garlic out for an entire 1 – 2 heads of garlic and roast them instead (here’s a good tutorial). Then just add to the serving bowl at the end when tossing. If you don’t have balsamic vinegar on hand red wine vinegar or lemon juice can be substituted. Four cheese ravioli is paired with fresh sautéed veggies and everything is coated with a buttery garlic herb sauce, balsamic vinegar and parmesan. And for a special touch walnuts are added for a nice crunch and toasted flavor. Such a delicious dinner! Cook ravioli in boiling water according to package instructions. Meanwhile heat olive oil and melt butter in a large skillet over medium-high heat. Add asparagus to skillet and saute until tender, about 4 minutes. Add tomatoes and garlic and saute about 1 longer, then toss in balsamic vinegar. Drain water from pasta once cooked through then pour into a large serving bowl. Add asparagus mixture to serving bowl along with walnuts, basil and parsley. Season with salt and pepper to taste and toss. Sprinkle in parmesan and serve warm.